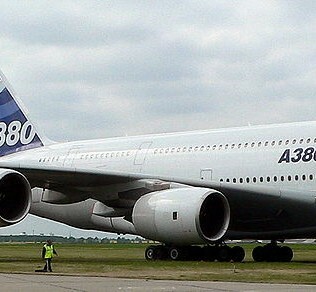 According to official data from Airbus, the A380 has a range of 9,444 miles (15,200 km) with its 84,500 US gal fuel capacity. Let’s see how far they’re actually flying this behemoth. 1. 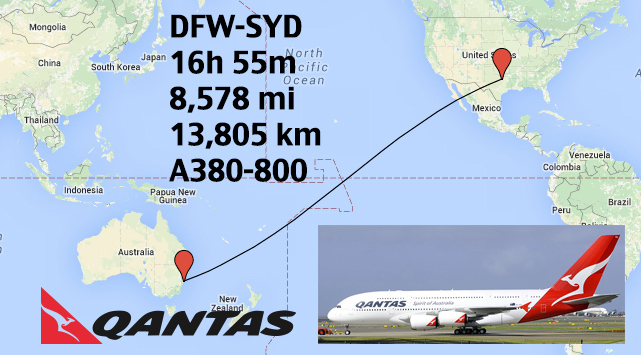 Qantas from Dallas-DFW to Sydney-SYD (flight number QF 8 / QFA8 – click here to track) is both the longest route operated by an Airbus A380 and also the longest non-stop scheduled commercial flight in the world. The trip covers 8,578 mi (13,805 km) in 16 hr 55 min and carries up to a whopping 484 passengers in 4 classes of service. 2. 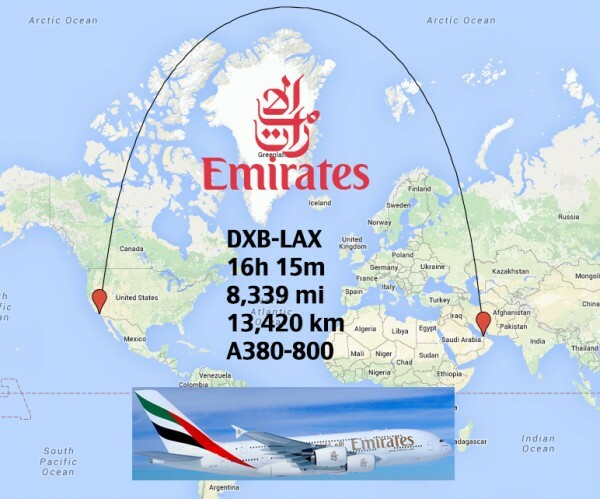 Emirates from Dubai-DXB to Los Angeles-LAX (flight number EK 215 / UAE215 – click here to track) begins the 4-in-a-row sweep of Emirates flights to/from the US. Covering 8,339 mi (13,420 km) in 16 hr 15 min, this route also earns the title of 4th longest non-stop flight in the world (Top 10: World’s longest non-stop flights). 3. Emirates from Dubai-DXB to Houston-IAH (flight number EK 211 / UAE211 – click here to track) covers 8,168 mi (13,145 km) in 16 hr 45 min. 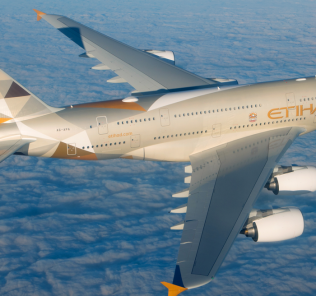 Previously flown on an Emirates Boeing 777-300ER, Airbus A380 service began in December 2014. 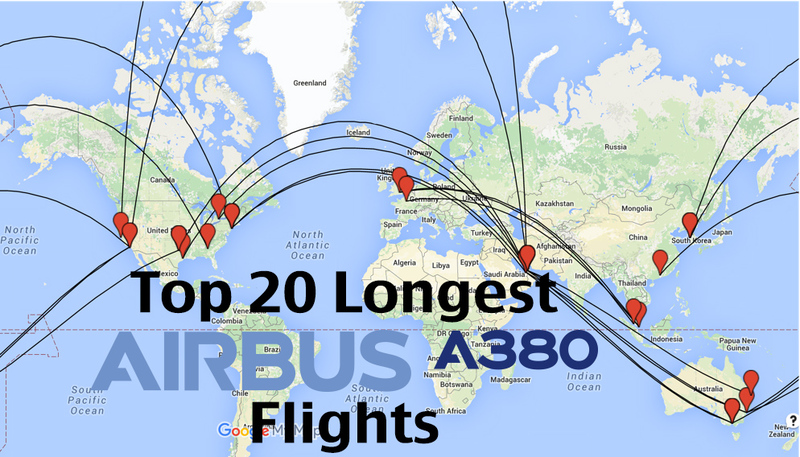 In addition to being the 3rd longest A380 flight, it is also the 6th longest flight in the world. 4. 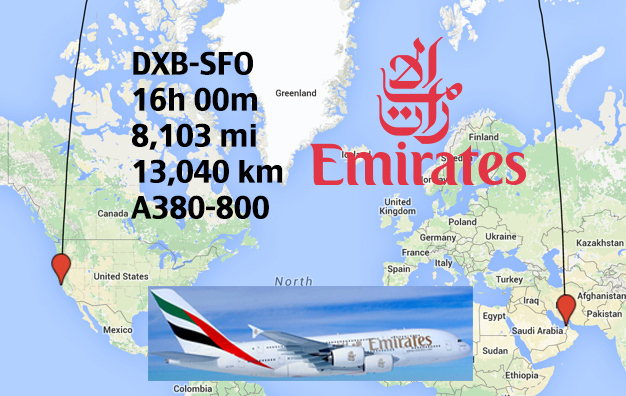 Like #3 above, Emirates from Dubai-DXB to San Francisco-SFO (flight number EK 225 / UAE225 – click here to track) was also switched from a Boeing 777-330ER in December 2014 to one of Emirates’ beloved A380s. 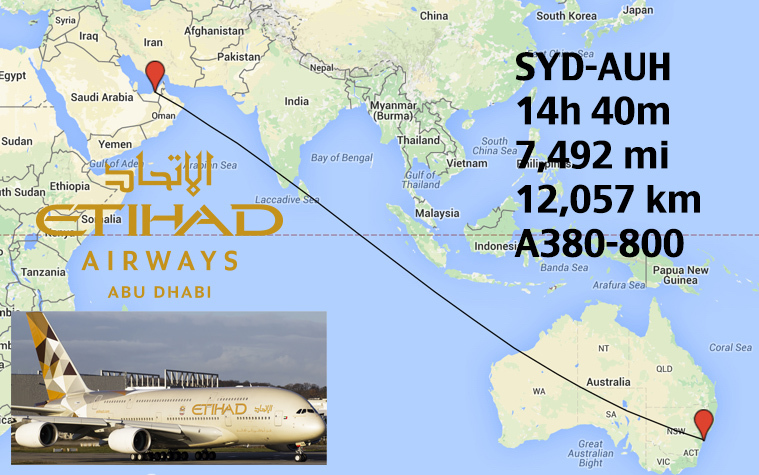 The 16 hr 00 min flight covers a distance of 8,103 mi (13,040 km). 5. Emirates from Dubai-DXB to Dallas-DFW (flight number EK 221 / UAE221 – click here to track) ends the 4-in-a-row Emirates sweep with a 4th US destination flight. 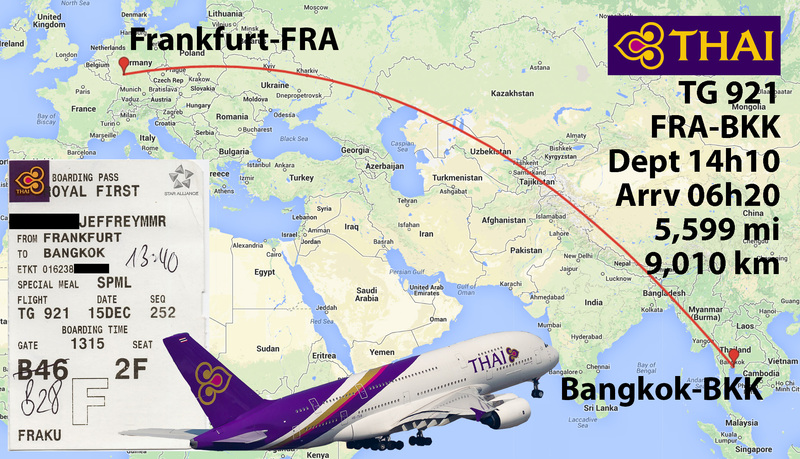 Frequent travelers on this route got the upgrade from a Boeing 777-200LR to the A380 in October 2014. The course covers 8,040 mi (12,939 km) in 16 hr 15 min of scheduled flying time. 6. 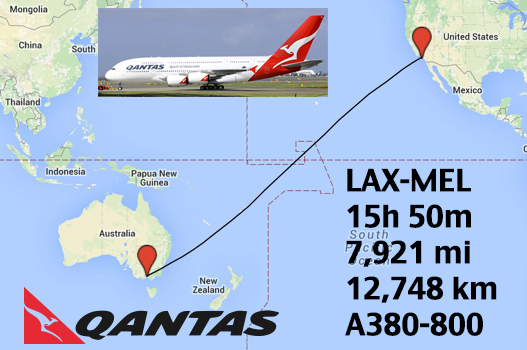 Qantas has been flying their A380 from Los Angeles-LAX to Melbourne-MEL for quite a while– since 2008. 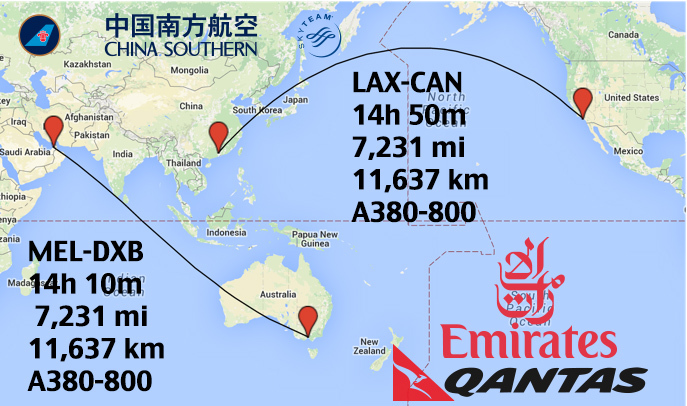 Flight number QF 94 / QFA94 – click here to track covers 7,921 mi (12,748 km) in 15 hr 50 min. 7. Etihad from Sydney-SYD to Abu Dhabi-AUH (flight number EY 455 / ETD455 – click here to track) covers 7,492 mi (12,057 km) in 14 hr 40 min. The service was started in June 2015, making it one of the most recent additions to the top 20 list. 8. Qantas from Los Angeles-LAX to Sydney-SYD (flight number QF 12 / QFA12 – click here to track) covers 7,488 mi (12,051 km) in 15 hr 00 min. 9. 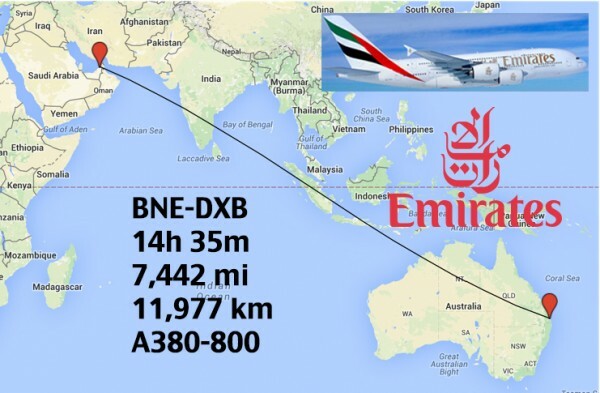 This route from Sydney-SYD to Dubai-DXB is a tie between Emirates and Qantas (flight number EK 413 / UAE413 – click here to track) covers 7,481 mi (12,039 km) in 14 hr 30 min. 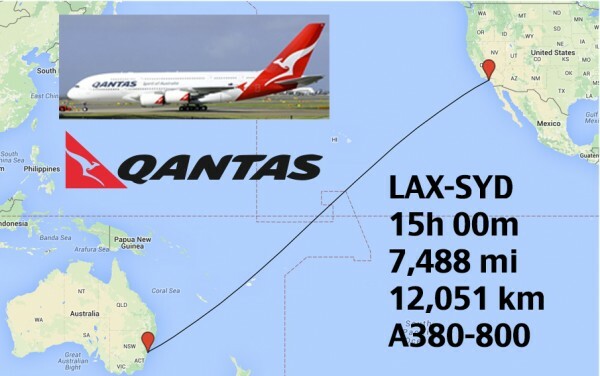 The Qantas route (flight number QF 1 / QFA1 – click here to track) is scheduled at 15 hr 05 min. 10. Emirates from Brisbane-BNE to Dubai-DXB (flight number EK 435 / UAE435 – click here to track) covers 7,442 mi (11,977 km) in 14 hr 35 min. 11. 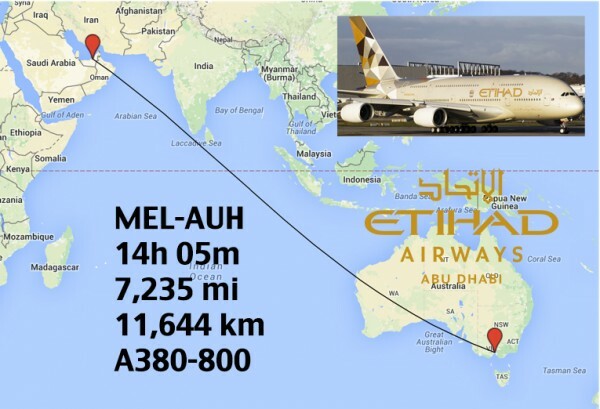 Etihad from Melbourne-MEL to Abu Dhabi-AUH (flight number EY 461 / ETD461 – click here to track) will cover 7,235 mi (11,644 km) in 14 hr 05 min when it takes its maiden flight on June 1, 2016. China Southern Airlines from Los Angeles-LAX to Guangzhou-CAN (flight number CZ 328 / CSN328 – click here to track) covering 7,231 mi (11,637 km) in 14 hr 50 min. 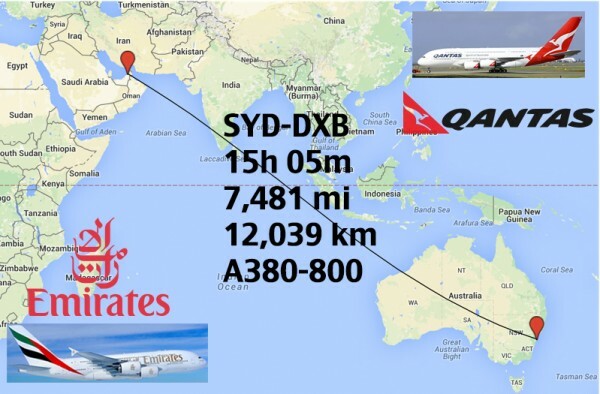 And also tied for 12th is: Melbourne-MEL to Dubai-DXB is another tie between Emirates (flight number EK 407 / UAE407 – click here to track) and Qantas (flight number QF 9 / QFA9 – click here to track). The route covers 7,231 mi (11,637 km) in 14 hr 05 min for Emirates and 14 hr 10 min for Qantas. 13. Korean Air flies the A380 on its Atlanta-ATL to Seoul-ICN route (flight number KE 36 / KAL36 – click here to track). Coming in at #13, the total journey takes 15 hr 10 min, covering 7,152 mi (11,510 km) of ground. 14. Korean Air from New York-JFK to Seoul-ICN has 2x scheduled flights per day (flight number KE 82 / KAL82 – click here to track and flight number KE 86 / KAL86 – click here to track) covers 6,906 mi (11,114 km) in 14 hr 20 min. 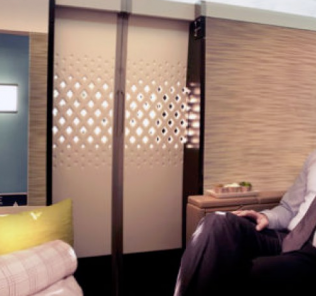 Between the 2 flights on the monstrous A380, Korean Air offers a total of 814 seats per day between New York and Seoul. 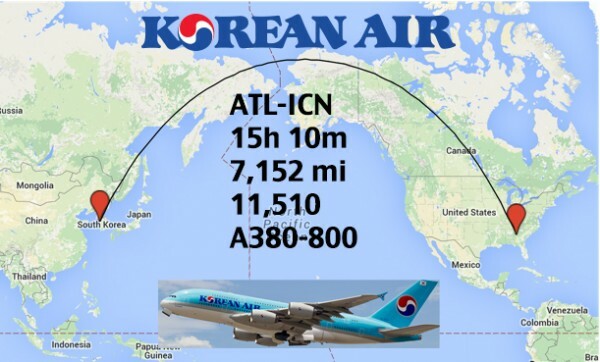 Also covering the route is Asiana from New York-JFK to Seoul, South Korea – Incheon International-ICN (flight number OZ 221 / AAR86 – click here to track). It covers 6,906 mi (11,114 km) in 14 hr 30 min. 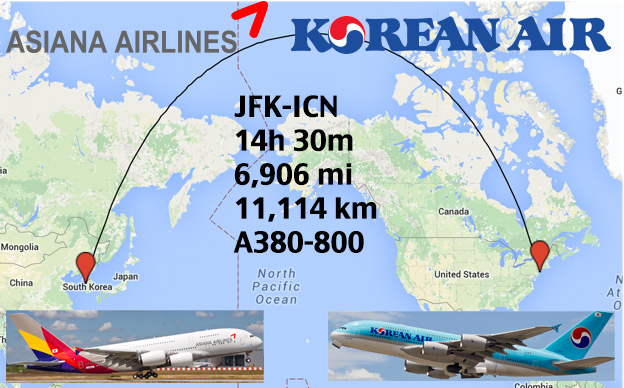 The Asiana route seems a bit less desirable as they cram 495 seats on board each A380, 21% more than Korean Air. 15. 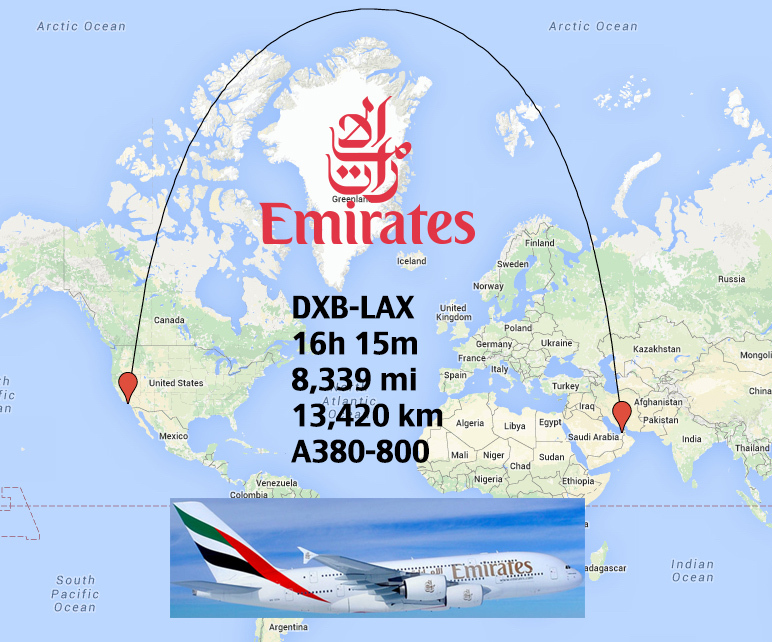 Emirates from Dubai-DXB to Toronto-YYZ (flight number EK 241 / UAE241 – click here to track) covers 6,899 mi (11,103 km) in 14 hr 10 min. 16. 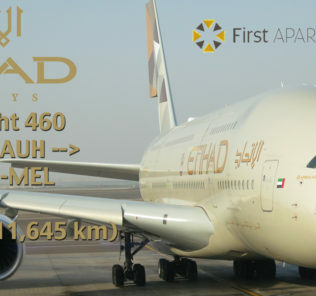 Etihad from Abu Dhabi-AUH to New York, NY – Kennedy-JFK (flight number EY 103 / ETD103 – click here to track) covers 6,867 mi (11051 km) in 14 hr 05 min. 17. 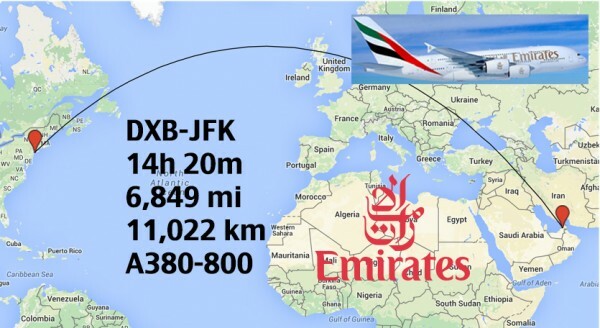 Emirates from Dubai-DXB to New York-JFK operates twice daily (flight number EK 201 / UAE201 – click here to track and flight number EK 203 / UAE203 – click here to track) and covers 6,849 mi (11,022 km) in 14 hr 20 min. 18. 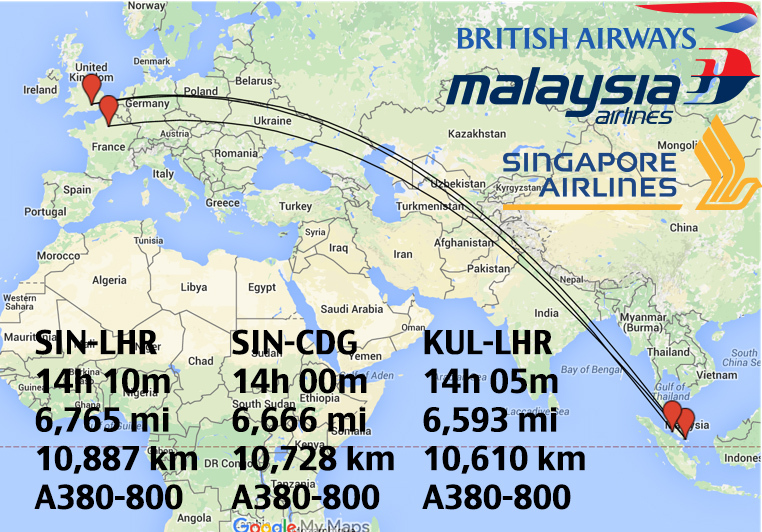 British Airways and Singapore Airlines are tied for the Singapore-SIN to London Heathrow-LHR, 6,765 mi (10,887 km) route. British Airways operates its A380 once daily (flight number BA 12 / BAW12 – click here to track) in 13 hr 50 min, while Singapore has 2x daily flights between the cities (flight number SQ 308 / SIA308 – click here to track and flight number SQ 322 / SIA322 – click here to track). The scheduled duration is 14 hr 10 mins. The 3x flights per day make this route the most heavily saturated A380 route in the world, offering 1,287 seats daily between Singapore and London on the aircraft type. 19. Singapore from Singapore-SIN to Paris-CDG (flight number SQ 336 / SIA336 – click here to track) covers 6,666 mi (10,728 km) in 14 hr 00 min. 20. 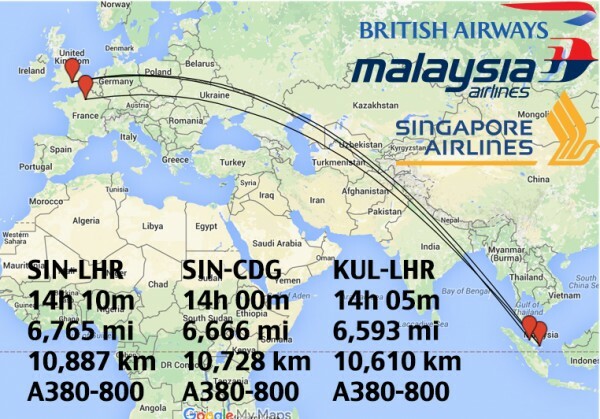 Malaysia Airlines operates 2x flights on their A380s between Kuala Lumpur-KUL to London Heathrow-LHR (flight number MH 4 / MAS4 – click here to track and MH 2 / MAS2 – click here to track). The route covers 6,593 mi (10,610 km) in 14 hr 05 min.